The Sunwolves have been axed from Super Rugby in favour of a 14-team competition, SANZAAR announced on Friday, after a substantial review. 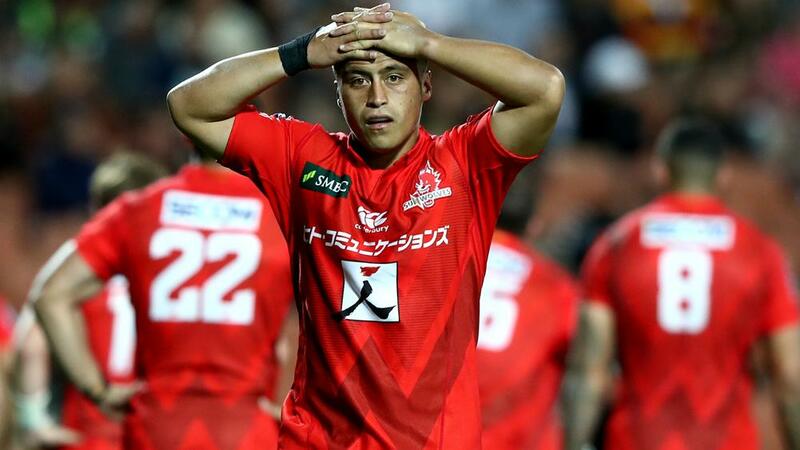 The Sunwolves – who have won one of their five games this season – only joined Super Rugby in 2016 and the news comes as a blow ahead of this year's World Cup, which will be staged in Japan. "The decision to further consolidate the competition format to a 14-team round robin was not taken lightly. It has involved some detailed analysis and a thorough review of the current and future rugby landscape, tournament costs, commercial and broadcast considerations and player welfare in line with our Strategic Plan," SANZAAR chief executive Andy Marinos said in a statement. "Factoring in the above analysis and review a 14 or 15-team round robin format were considered, as these models delivered best against the criteria we were seeking, including a format that would see each team playing every other team leading into a finals series." "SANZAAR was advised by the Japan Rugby Football Union [JRFU] in early March that they would no longer be in a position to financially underwrite the Sunwolves future participation post 2020. The future of the Sunwolves will now be determined by the JRFU which has determined that Super Rugby no longer remains the best pathway for the development of players for the national team," Marinos said. "However, Japan and the Asia Pacific region remain strategically important to SANZAAR. We will continue to work with the JRFU, Japan Super Rugby Association [JSRA] and other stakeholders, as we have done throughout this review process, to establish a truly professional league structure in Japan in which current and potentially new teams could participate. "We have presented options to them around the establishment of a Super Rugby Asia-Pacific competition structure including Japan, the Pacific Islands, North and South America and Hong Kong. The concept includes linking high performance programmes of such nations into the potential competition structure. The aim is to deliver a competitive and sustainable international pathway that can align to both current and future considerations around the international calendar. "We would like to thank the JRFU for their continued support and look forward to working with them going forward and we will continue to be supportive of the Sunwolves through the 2019 and 2020 super rugby seasons."